Why the Hulk? Because it's green of course! I know I am a little late jumping on the green smoothie bandwagon but it wasn't from lack of interest, rather from lack of equipment. While I am the queen of kitchen gadgets one thing I don't have is a blender (well actually I do have one that fits on top of my 35 year old Kenwood Chef mixer but it's pretty much useless so it doesn't count). I saw this gorgeous green smoothie on The Healthy Chef blog and was immediately inspired to try it. I loved the tip she had about replacing the fresh spinach leaves and ice with cubes of frozen spinach. Genius! I first attempted to make it in my food processor. It blitzed all the ingredients quite well but I was still left with lots of large spinach flecks. I then tipped the mix into a jug and tried to blend it with my stab mixer. It frothed up a bit more but still left lots of green specks. Despite the fact it looked more like a herb bechamel than a smoothie I drank it anyway. It was AWESOME. My 3 year old who watched me make it also had a taste and then begged to lick the spoon, the glass and anything else this smoothie may have touched. It was that good. 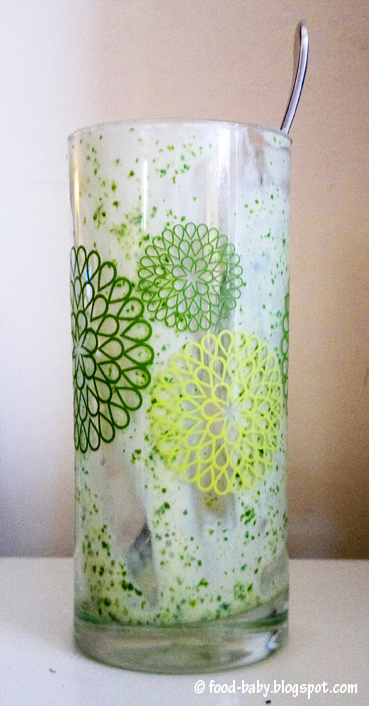 I took a pic of my now empty glass covered in spinach flecks just to have some sort of photo to accompany this recipe. Hopefully it doesn't put you off your breakfast. Blender or no blender I will be making this again (and again, and again ...). Such a fantastic way to get in some extra greens and even better that it tastes so good. And no you can't taste the spinach at all! Combine all ingredients in a blender. Blend until smooth and serve immediately. OMG! This looks absolutely awesome! I wish I had a ripe banana to freeze right now!!!! Thanks for sharing!